The Walt Disney Company and Disney Parks have modified several Space Mountain roller coasters to have a Star Wars theme. The Walt Disney Company acquired the Star Wars franchise when it purchased Lucasfilm near the end of 2012. Currently The Walt Disney Company continues to integrate the brand into their theme parks with new attractions. Disney Parks has not developed a Star Wars themed Space Mountain ride at Walt Disney World. 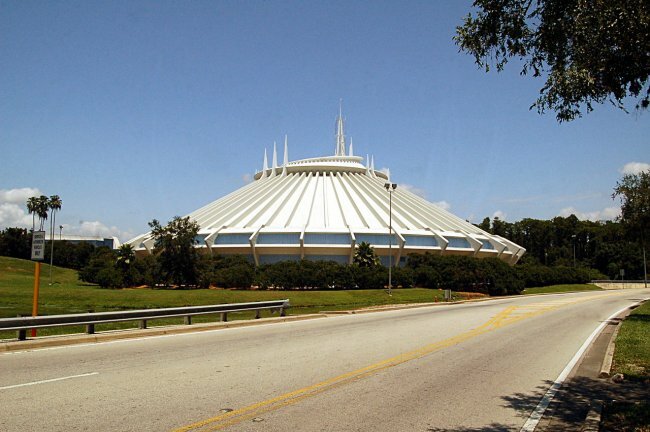 There has not been a Space Mountain Star Wars ride at Disney World. Walt Disney Parks has modified the Space Mountain rides at the other theme parks to have a Star Wars theme. At the D23 Expo in 2017, Disney Parks announced that there will be new Star Wars attractions at Walt Disney World, however, Space Mountain will not be changed. Above Space Mountain exterior photo (no Star Wars branding) by Eric Marshall on Wikimedia Commons. Photo modified, slightly, by NavFile. Photo is released under a Creative Commons License. Disneyland California and Disneyland Paris have had Star Wars themed Space Mountain roller coasters. The Walt Disney Company only showcases Star Wars on Space Mountain seasonally (from time to time). At the time this article was written Disney Parks had ended the Star Wars theme on both Space Mountain rides at Disneyland California and Disneyland Paris. Disneyland Paris recently had its Space Mountain ride, Space Mountain: Mission 2, changed to Star Wars Hyperspace Mountain on May 7th, 2017 or May 12th, 2017. After a few months, Disney changed the ride back to its original format. Disneyland California’s Space Mountain was the first version to receive the Star Wars branding and was changed to be called Hyperspace Mountain. Disney Parks, changed the ride in 2015 to be called Hyperspace Mountain and gave it Star Wars themed branding that included new Star Wars projections. The ride was changed back to the original Space Mountain layout on June 1st, 2017. Disney Parks also changes the Disneyland Space Mountain ride to have a Halloween theme during the Fall season. The company calls the ride Space Mountain Ghost Galaxy. You can learn more about it on our dedicated Ghost Galaxy page.